Hedwig Place is a five-story, 102,474 square feet Class A medical office development located on a two-acre site south of Interstate 10 in Hedwig Village. 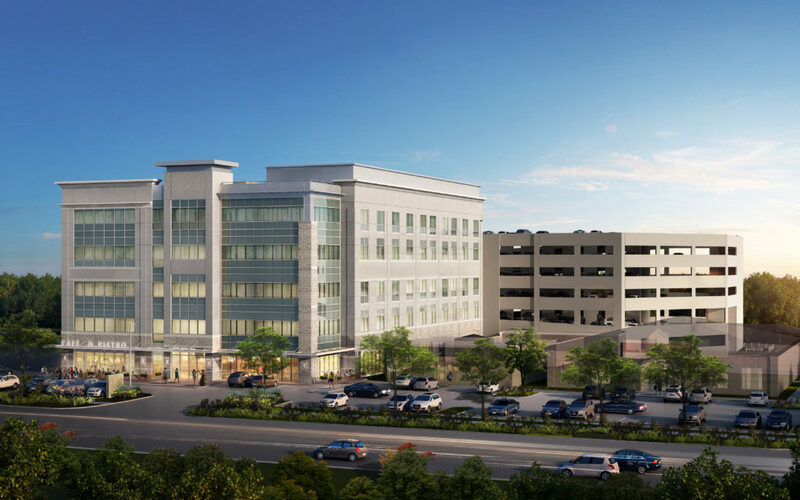 It is the first new office development for the affluent area in more than 30 years per Bisnow. The building includes a ground floor restaurant and a six-story freestanding parking garage. Located just east of the Memorial Hermann Memorial City Medical Center, Stream Realty developed Hedwig Place in partnership with AMD Global and Diamond Realty Investments, answering the community’s needs for an easily accessible state-of-the-art healthcare facility in the area. The development will include improved vehicular access from the adjacent neighborhood, walkability, and cross-access to existing and future developments. Interiors will be all high-end finishes. The site will also include many large trees, a signature of the surrounding established neighborhoods. Construction is expected to be complete mid-2019; the center is 65% pre-leased. 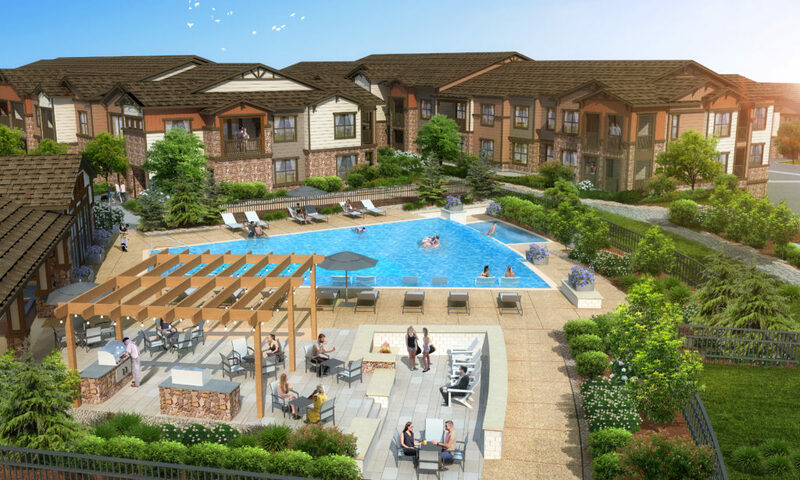 We’ve been working with the Denver office of Price Development Group (PDG) to develop renderings for their newest multifamily property, PEAK83. The 255-unit Class A garden-style development sits approximately 25 miles southeast of Denver and has easy highway access to the growing Denver Technology Center. The location on the outskirts of Denver boasts unobstructed views of Pikes Peak. PEAK83 is scheduled to open later this year. Inside, PDG created a contemporary environment with a mix of clean lines, crisp details, and pops of color. Floor plans range from 705 s.f to 1,423 s.f. in two and three-story layouts. Amenities include the typical fitness center and locker rooms, media/entertainment center, collaborative workspaces with private offices, and group kitchen. PEAK83 also offers residents an indoor golf simulator, bike and ski repair shop, and a pet spa. Outside, the resort-style pool is surrounded by covered grilling stations, a sunken conversation cove with a firepit, a gated dog park, and expansive views of the Rocky Mountains. This year marks PRISM’s 13th anniversary. This milestone certainly would not have occurred without the continued patronage of a growing list of clients. For this, we are most grateful. We also appreciate the relationships we’ve cultivated with our clients; it’s this aspect of our work that we’re most proud – knowing our clients well enough to understand their respective goals and being entrusted to help fulfill them. Yet, without the amazing team of professionals here at PRISM, none of this would be possible. Our business model depends on our team working remotely, often during non-standard business hours. So we take every opportunity to gather and deepen our bonds whenever possible. 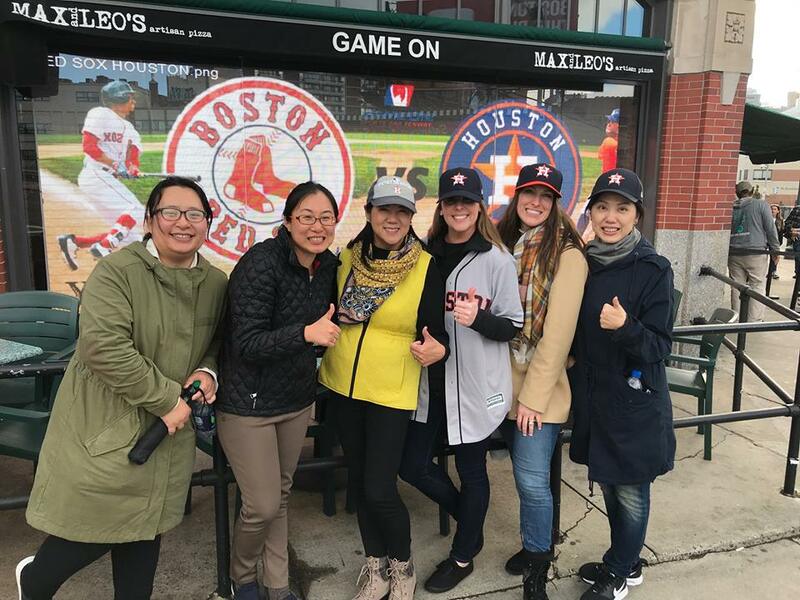 Earlier this month we traveled to Boston to visit our colleagues there. What an amazing time we had walking the historic streets and feasting on delicious local specialties. We even had the great luck to be there for Game 1 of the ALCS! It was definitely an experience we will all treasure, as you can see in this photo album. The Hanover Company is one of our longest-standing clients. We’ve had the opportunity to serve this multifamily developer since 2006. Since Hanover’s founding in 1982, the company has delivered more than 56,000 units across the country.